The Wirral Cardiac Rehabilitation Programme is run from the centre of Birkenhead in St Catherine's Community Hospital and also from the Wallasey Heart Centre, based at Victoria Central Hospital, Wallasey. Any patient suffering from a heart related condition may be able to access one of the rehabilitation education and lifestyle programmes available. Referrals include Angina, post heart attack, before and after heart surgery, pacemakers, Implantable Cardioverter Defibrillators (ICD), heart transplant, patients with Diabetes, heart failure, mini stroke (TIA, if appropriate). Patients admitted to our local hospital at Arrowe Park will already have been seen by one of our Cardiac Rehabilition Practitioners and been provided with information both verbal and written. Out of area referrals will be received via fax/phone or letter from other cardiac rehabilitation teams. Within a fortnight of discharge, all patients are contacted on the phone to assess progress and to invite them to a full assessment lasting 45 minutes to 1 hour, with their named Cardiac Rehabilitation Practitioner, to take place at St Catherine's Hospital or the Wallasey Heart Centre. The assessment will involve a full psychological, physical and lifestyle profile. 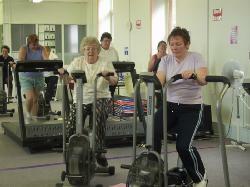 Phase 3 Cardiac Rehabilitation takes place over 1 afternoon per week for six weeks. The classes include educational talks, information and advice giving, exercise and relaxation. On completion of the basic rehabilitation programme, suitable patients may access the exercise suite for a twice weekly, 12 week programme of supervised graded exercise. This programme is to enable patients to achieve a level of fitness that will help them become active enough to perform every day activities and maintain their health. Upon completion at any stage of the programme there are many activities that patients can access in order to maintain their health in a safe and friendly atmosphere. Apart from Cardiac Rehabilitation, the Wirral Heart Support Centre runs programmes for patients with Diabetes who are at a high risk of developing heart problems. They also have an Angina Management Programme and a Living with Heart Failure Programme. 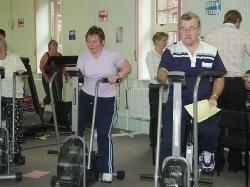 Patients with heart disease may also access a Lifestyle and Weight Management Programme at the Centre.